Early note-reading confusion can be alleviated with an introduction to Guide Notes. Guide notes are easily-recognizable notes on the staff that can be memorized and then used as decoding tools for future note reading. At the beginning of WunderKeys Primer Book Two, students learn Bass F, Middle C and Treble G as “Wunder Notes” (Guide Notes). Learning to instantly recognize each of these three notes is an important step in learning to note-read fluently in both the treble and bass clefs. 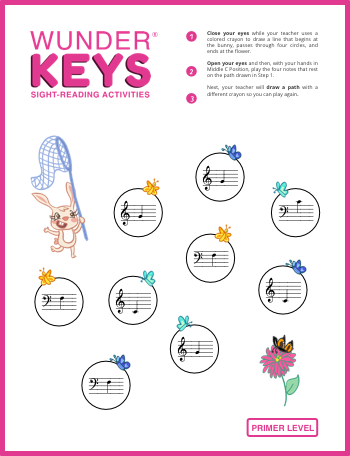 With today’s sight-reading printable your students will have a blast as they help Ruby catch butterflies while playing with Bass F, Middle C and Treble G. You can use it along with WunderKeys Primer Book Two, Lesson 1 or as a review for students who need it. Click on the image below to download today’s printable. And don’t forget to check out WunderKeys Primer Piano Book One and WunderKeys Primer Piano Book Two.